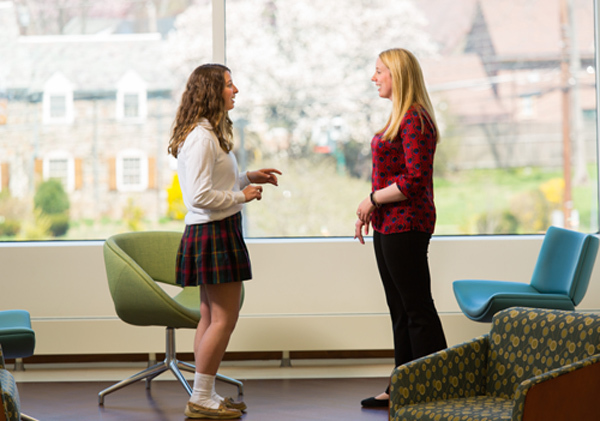 As one of our main core values, Merion Mercy provides a college preparatory curriculum that promotes self-confidence and challenges students to reach their potential, while instilling a love of learning. We aim to develop each young lady's unique strengths and talents in appreciation for who she is and who she hopes to become. While our coursework is challenging, our students are not "tracked." Each girl's progress and growth is evaluated every year, and adjustments and recommendations are made by both teachers as well as the Head of School for Academic Affairs, in order to ensure that she is on her own path for success. Students are required to complete at least 24 credits (at least six credits per academic year). Note: 51 electives are offered, including Art and Music Majors. Level AP: Advanced Placement courses for which college credit may be received. Students are expected to take the AP exam at the end of the course. The AP exam fee will be added to the tuition bill. Level A: Advanced courses. Qualifying marks and department approval are prerequisites for most of these courses. Level CP: All other courses are standard college preparatory courses.